All peppers (Capsicum spp.) have their origin in the Americas. With the arrival of the Spanish and Portuguese to the Americas in the 15th and 16th centuries, pepper types were brought to countries all over the world. Peppers were one of many crops, including tomatoes (Solanum lycopersicum), corn (Zea mays), and hard squashes (Cucurbita spp. ), all originally from the Americas, that were readily adopted by cultures around the world. Types of peppers such as “Thai hot” and “Hungarian wax peppers”, for example, were selected for specific characteristics in Asian countries and Hungary, respectively, from types of peppers that originated in the Americas. Even in Mexico, a country known for its strong partiality for hot peppers in their cuisine, one can find sweet bell peppers in Mexican markets, even though they are not commonly used in traditional Mexican dishes. Bell peppers have been observed in the following countries in Latin America by Frank Mangan: Brazil (Figure 2), Chile (Figure 3), Costa Rica (Figure 4), Cuba (Figure 5), El Salvador (Figure 6), Honduras (Figure 7), Mexico (Figure 8), and Venezuela (Figure 9). The use of bell peppers will vary from country to country in Latin America, and will even vary within a country. For example, in several Central American countries, multiple pepper types, including bell peppers, are used as one of the ingredients for encurtido (“pickled” in Spanish). Vegetables are fermented in vinegar and salt and used as a side dish. Jars of encurtido can be found on tables in restaurants to be used as a condiment. Encurtido found in Honduras (Figure 10) and El Salvador (Figure 11). Encurtido is also used in Mexico; however, it is normally with jalapeno peppers and not bell peppers. In Mexcio, they also call anything pickled en vinagre (in vinegar); i.e. jalapeños en vinagre (pickled jalapenos) (H. Godoy-Hernandez, 2016). See healthy recipe for a Salvadoran encurtido, “Encurtido Salvadoreño” at the NIH National Health, Lung and Blood Institute. Some Puerto Ricans, Dominicans, and Cubans use bell peppers as an ingredient for sofrito when making a staple mirepox. 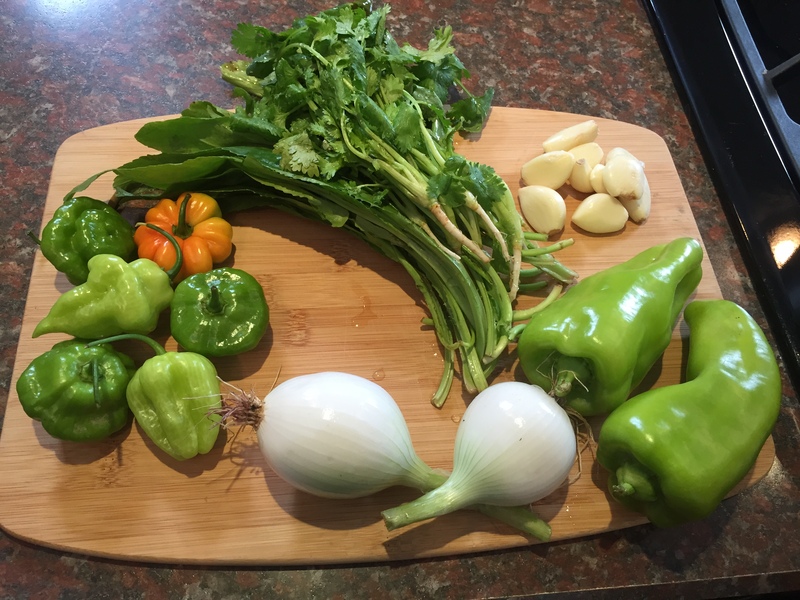 The traditional peppers used in sofrito are ají dulce and cubanelle peppers; however, bell peppers will be used as a substitute for one or both of the more traditional pepper types. One reason for using bell peppers in lieu of ají dulce peppers is that they are substantially cheaper than bell peppers in the United States. Another reason could be due to the fact that there have been issues with ají dulce that have become spicy (hot) due to crossing with habanero peppers, as described in more detail on the ají dulce page. For information on production and management of bell peppers, refer to the New England Vegetable Management Guide and click on "pepper". 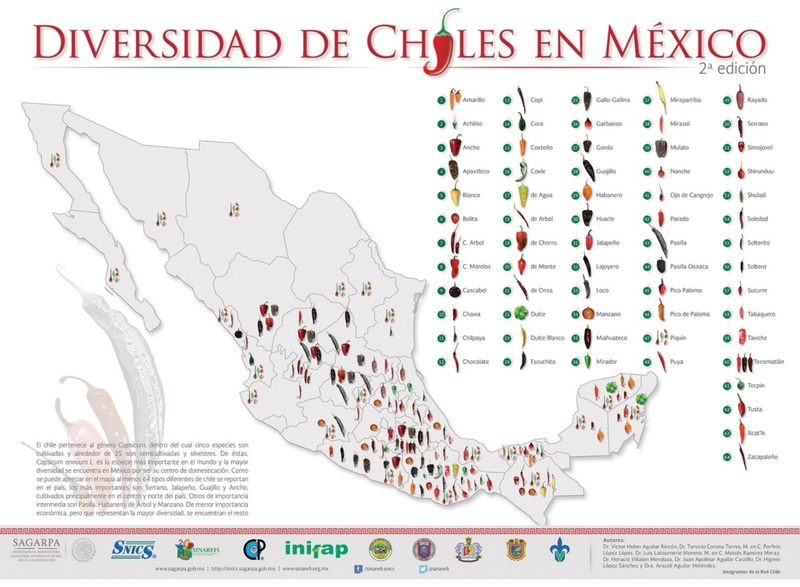 There are many different varieties of bell peppers observed in Latino markets, as observed in the photos above. In Massachusetts, for example, farmers in different countries will grow bell pepper varieties that are well adapted for their specific climates. Thus, we recommend growing varieties of bell peppers for these Latino markets that grow well in your area. Heriberto Godoy-Hernández. Personal Interview. Amherst, Massachusetts, December 5, 2016.